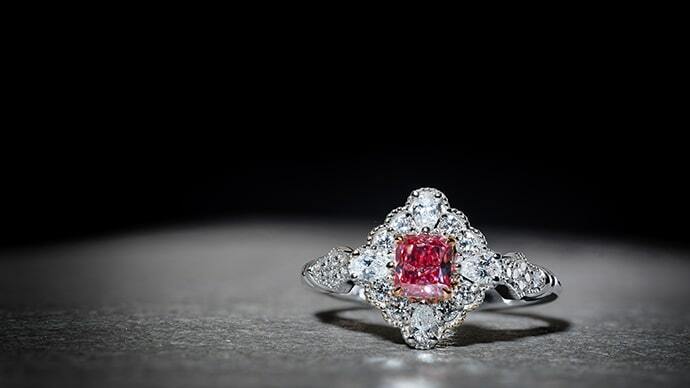 When one looks at any given engagement ring, it seems as though the utter beauty of the stone was what drew the ring wearer to that particular gem. However, the truth is, selecting the right stone for an engagement ring is slightly more complex than going with a preferred stone within a certain budget based on taste alone. Other important factors such as shape, colors, and size, which can all either complement or clash with one’s natural size, height and coloring, are crucial to take into account as they will affect the final product’s appearance as a whole. Therefore, when shopping around for an engagement ring stone, consider the various gemstone shapes, ring settings, and customizable options that are available to enhance and properly display your treasured stone. In order to be certain that you have selected the proper stone for your ring, you must be aware of the many different gemstone shapes and understand that certain shapes will bring out different qualities in a stone than others. Also, some of these qualities are more present or are of more importance in certain stones more than others. The round shape is very popular for colorless diamonds, as it utilizes the brilliant cut in the most ideal way. This shape looks wonderful on practically any body types, yet it comes with a heftier price tag. Princess-cut diamonds are a close second to round brilliants when it comes to colorless diamonds. 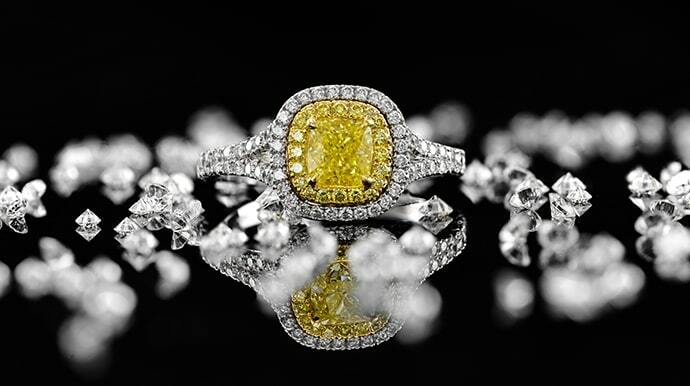 If looking specifically for a color diamond, and this shape attracts you, be very selective. It is more difficult to attain a good color with round or princess cuts. 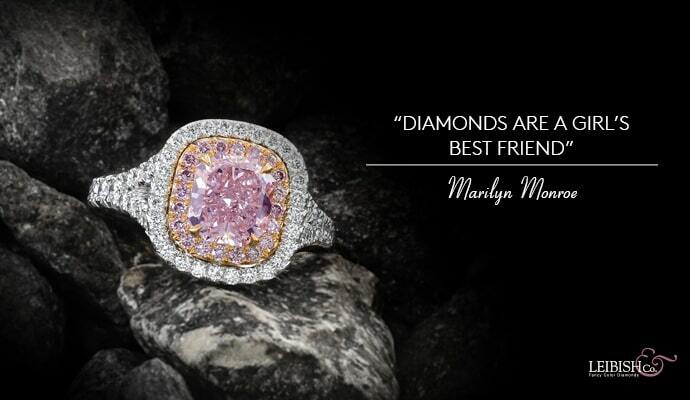 In fact, that’s the reason there are more radiant or cushion colored diamonds available. 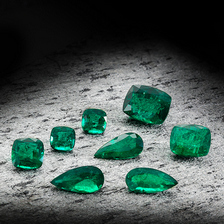 Not that this shape is less ideal, but for certain gemstones like emeralds (which are softer than diamonds or sapphires), you need to be careful with princess shapes due to its delicate corners. Heart-shaped diamonds and gemstones have a romantic or cute appeal, depending on how you look at it, without even getting to the color. Though, you have to choose carefully as diamonds cut into this shape are at risk of having a bow tie effect, which is basically a shadow shaped like a bow tie that can appear in the middle of the stone. Nevertheless, it makes a wonderful shape for anyone looking for something unique and soft. As an elongated shape, oval-shaped diamonds and gemstones are especially suitable for those looking to make their finger appear longer and slimmer. Additionally, this shape can be a great compromise for those who like the idea of a round diamond but don’t want to pay the high prices and would also prefer a more unique shape. 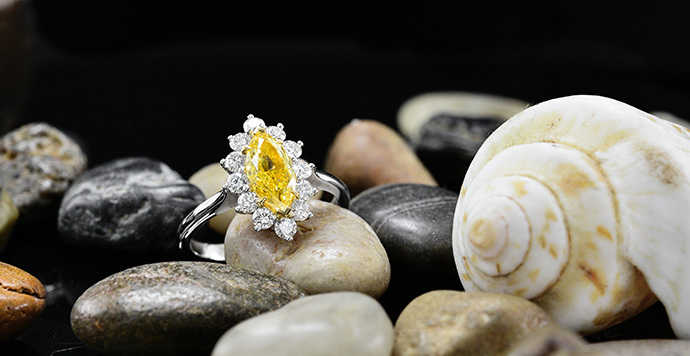 Marquise gemstones are just the thing for those looking for something different. This shape also elongates the finger and is kind of a blend of the oval and pear shapes. Cushion-shaped stones are exactly what they sound like: stones cut to look like a cushion. This is not a particularly popular shape for colorless diamonds but is actually the go-to shape for color diamonds as it is ideal for displaying color. 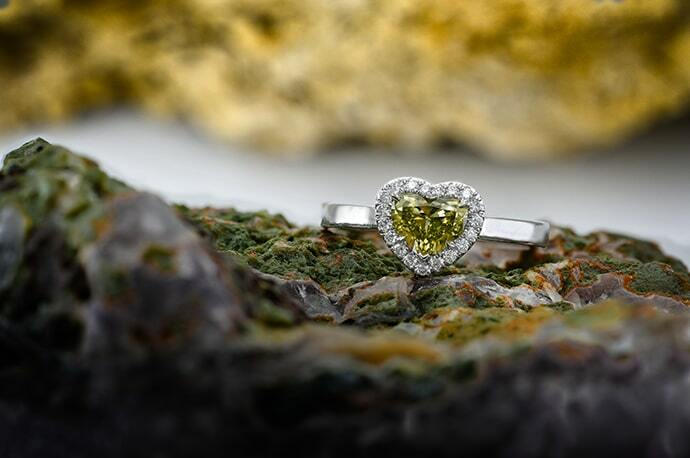 The radiant shape is the other popular shape for color diamonds. Diamond cutters favor the radiant and cushion shapes for color diamonds because of how the light is reflected between the facets of these stones. Once you have decided on a gemstone, based on either the appropriate shape for you or the stone with the most suitable coloring, you will now need to choose a setting for the particular stone and stone shape that you have chosen. The four main options are: solitaire, halo, three stone, and side stones. While budget and personal style are certainly important factors, other significant elements to consider include day-to-day functionality, your dimensions, and your personality. 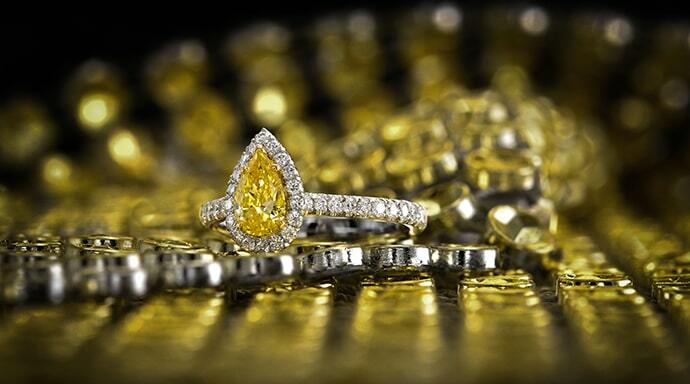 Solitaire settings are by far the most popular style for a myriad of reasons. For starters, it requires only one stone making it more budget-friendly. Second, it is simple and goes with practically everything and can be worn from morning till night without being out of place. However, for those with a budget for a very small stone, a solitaire ring can get “lost,” especially when worn by someone with bigger hands. Other styles such as the stunning halo and side stone setting incorporate additional smaller stones that make the ring look busier, bigger, and help it make more of a statement. Lastly, if you can and want to get all bling-y, whether it’s because your budget simply allows for it, you’re all about making the largest statement possible, or because you just think it will “go” with your wardrobe and general style, the three stone setting may be for you. 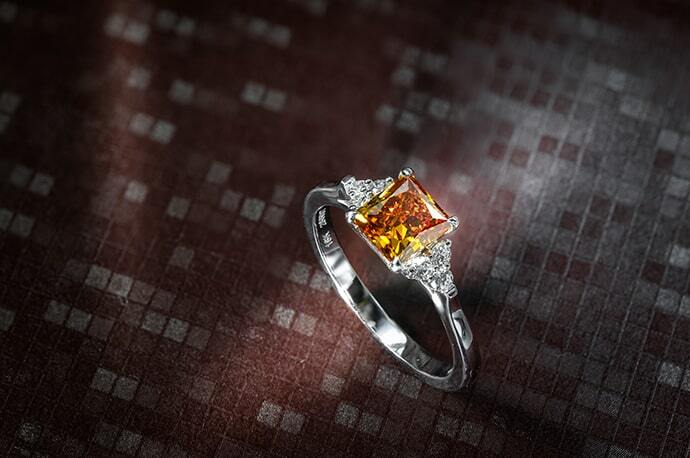 It consists of your center stone flanked by two slightly smaller stones. They can be identical in shape and color to your center stone or can contrast it. For instance, if you have chosen a round diamond for the center, you can select additional smaller round diamonds for the sides or go with something a bit bolder like pink diamonds or red rubies. 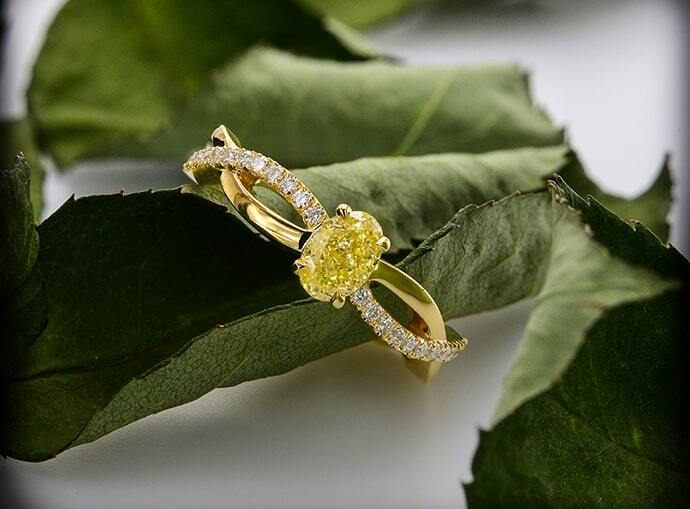 Now that the stone and setting are behind you, you must ask yourself if you are okay going with a standard setting or would like something customized for you. Higher quality stones generally have settings customized to fit their specific needs. This ensures that every single aspect of the stone is highlighted and that nothing is overlooked or hidden. Some of these settings that are constructed around the stone cannot even be detected as something out of the ordinary to the untrained eye, and yet the difference is drastic and is crucial for the final high-end product. For example, when the metal is modeled around the stones, each setting ends up being slightly different. If a ring has many smaller stones on the band, the metal will be placed in such a way that the stones are evenly distributed. This will result in a meticulous work of art and at the same it is impossible for it to be just like another as each and every stone is slightly different in size and shape. The history of engagement ring giving is a long one. Although there is much to why engagement rings are worn and why gemstones are used, here is another take on the whole phenomenon. Finding your better half is no simple feat. It is like finding a needle in a haystack. While there may be a plethora of options for engagement rings, or so it may seem, there really should be one that is just for you. This uniqueness will serve as a constant reminder of the unique love you share with your partner. 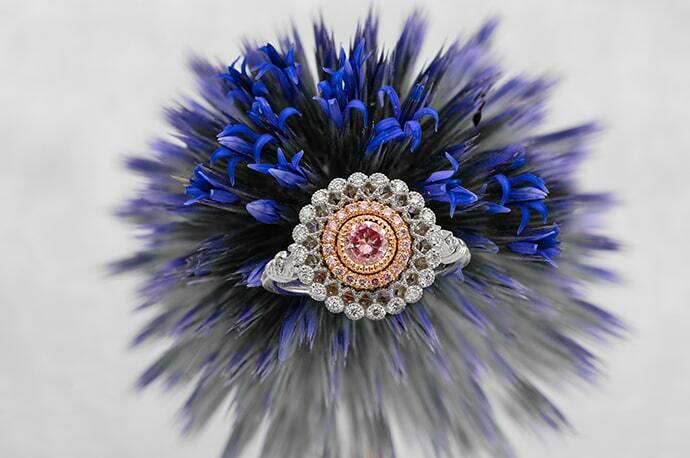 Check out our collection of fine diamond and gemstone engagement rings.